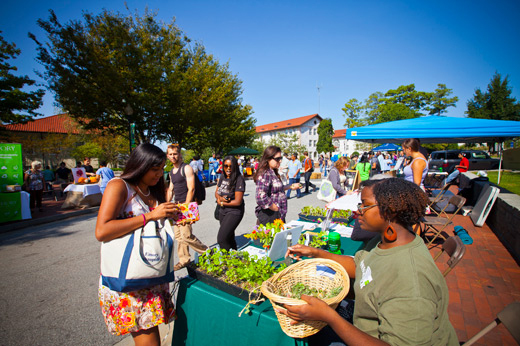 Emory celebrates Earth Month throughout April after getting an early start with the Earth Festival on March 31. Emory’s Office of Sustainability Initiatives is compiling Earth Month events for a community calendar. Departments, schools and groups can mail Melanie Aleman to get activities on the calendar. “Assessing Resilience and Governance in Regional Scale Water Basins Facing Climate Change” at 4 p.m. at 207 White Hall features Lance Gunderson, professor in the Department of Environmental Science and executive director of the Resilience Network. The discussion is sponsored by Climate@Emory. 2015 National Start Walking Day will take place at 21 locations with over 30 walks and culminate with a walk/run finale from the Woodruff P.E. Center at 5:30 p.m. Register for the event, sponsored by Healthy Emory. Emory Recycles sponsors two big campaigns throughout the month. The Surplus Properties Year-End Sale offers all items at 50 percent off in April. The Surplus Store is located at Emory’s Briarcliff Property. This year-end sale during Earth Month is a thank-you for supporting waste diversion on the campus. The second campaign is Emory Recycles’ Move Out Program: Don’t Dump It — Donate It, which begins in April and continues through May. Collection trucks will be at the Dobbs University Center Loading Dock, Alpha Phi Alpha/Sorority Village, Woodruff Residence Hall, Clairmont Tower and Harris/Complex to collect unwanted clothing, household items and school supplies from students moving out of their residence halls. Proceeds from donations sold will be given to local charities. On Wednesday, April 8, the Global Health and Development Discussion Group will hold a discussion on critical topics in development in a reading group led by anthropology professor Peter Brown. This discussion and a light lunch will be held at 1 p.m. in 206 Anthropology Building. Email the Development Studies Program ahead for the readings to be discussed. Faculty, staff and students can drop off personal, confidential documents for secure shredding and recycling at the Recycling Center, located at the end of Peavine Creek Drive near the Kaminsky Soccer Field. Drop-off hours are 7 a.m. to 2 p.m. This is for paper materials only. What role can psychoanalysis play in understanding the ecological crisis and climate change? Find out from Joseph Dodds of the University of New York in Prague speaking on “Feeling the Heat... What is Ecopsychoanalysis? Psychoanalysis and Climate Change in the Three Ecologies." The talk will be Monday, April 13, at 5:30 p.m. in 112 White Hall. It is sponsored by the Psychoanalytic Studies Program and the Center for Mind Brain and Culture. A Climate@Emory seminar “Communicating Climate. How and Why” will be led by Dione Lee Rossiter, director of Mass Media Science and Engineering Fellows Program for the American Association for the Advancement of Science. It will be Wednesday, April 15, 4 p.m. in 207 White Hall. Emory astrophysicist Erin Bonning has developed a special planetarium program in conjunction with the exhibition “African Cosmos: Stellar Arts” at the Michael C. Carlos Museum. The planetarium show and tour of the museum gallery, focusing on the stars, the movement of the sun, and the phases of the moon, will be Sunday, April 19, at 3:30 p.m. in the museum and the Math and Science Center Planetarium. The Emory community is invited to come by the Rollins School of Public Health courtyard between the Grace Crum Rollins and Claudia Nance Rollins buildings for Earth Day Gardening on Thursday, April 23, from 11 a.m. to 1 p.m. Materials will be provided by the Emory Global Health Organization to start a mini-garden by planting seeds in small, recyclable pots. Climate@Emory’s Inaugural Climate Change Day of Scholarship debuts Friday, April 24, from 8:30 a.m. to 5 p.m. in 208 White Hall. The goal is to initiate collaborative research between Emory faculty, staff and students, as well as researchers from the greater Atlanta area. All are invited — from those already involved in climate change research to the simply curious. Celebrate the beginning of the bountiful season of Georgia berries and other local produce at Emory Farmers Market with Emory Dining and the Office of Sustainability Initiatives. On Tuesday, April 28, from 11 a.m. to 3 p.m., the Farmers Market, on the Cox Hall Bridge, will feature berry-themed cooking demos and prizes. Off campus, CHaRM, the Center for Hard to Recycle Materials, will have its grand opening Saturday, April 18. Located at 1110 Hill Street in Atlanta, this is a permanent facility to encourage reuse while diverting thousands of pounds of household hazardous waste, bulky trash and other hard to recycle items from local homes, water supplies and landfills. CHaRM will also be promoted by student volunteers at the Atlanta Dogwood Festival Eco-Village from Friday to Sunday, April 10 – 12, at Piedmont Park. For more information, see Live Thrive Atlanta.